This week has been a whirlwind with so many things happening I haven’t had time to blog. Very exciting but also busy. However, here is the DIY project I promised you. Since I got a new working space I’ve been trying to organize it the best I can. I bookmarked these instructions ages ago and now found use for them. 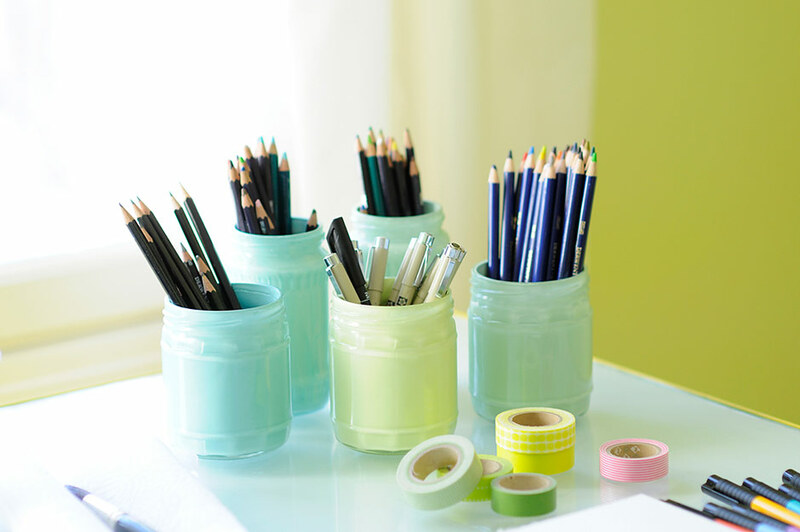 I also found use for our leftover paints and glass jars that tend to pile up in cupboards. We have a large(ish) collection of jam and jalopeno jars from which it was easy to choose matching jars. 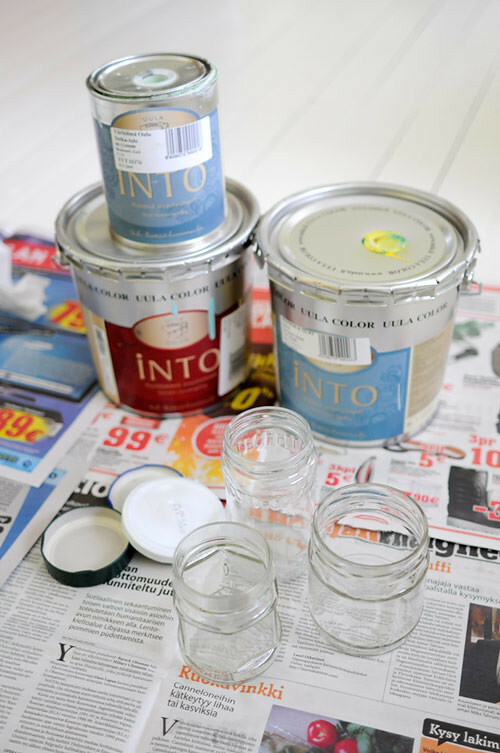 The paint should be thick enough so it’ll stick to glass, but not too thick. I used Uula Into in different colors. 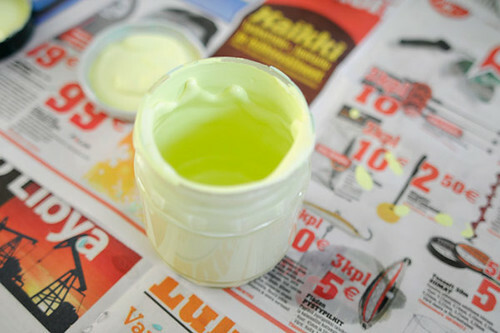 The yellow Into was too thick, I should have diluted it with water (Uula Into is water-thinnable). The others were fine. And this is what you do. Clean and dry the jar thoroughly. Pour in some paint. Swirl and shake. Twist and turn. It helps if you close the lid, that way you don’t get paint all over. 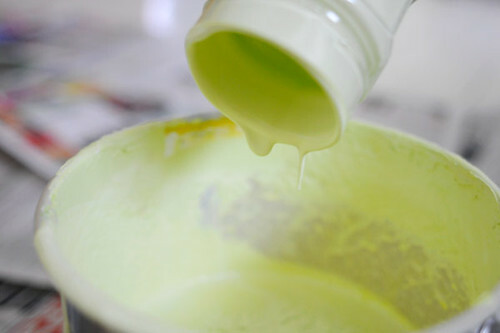 Pour the most excess paint back in the paint can. Leave the jar upside down to drip (lid on!) I left mine overnight. Pour out the remaining excess paint. This is what happens when your paint is too thick. It stays like that. You can try to wipe it, but be careful not to remove too much. You don’t want clear glass to show. Wipe the rim clean before the paint dries. 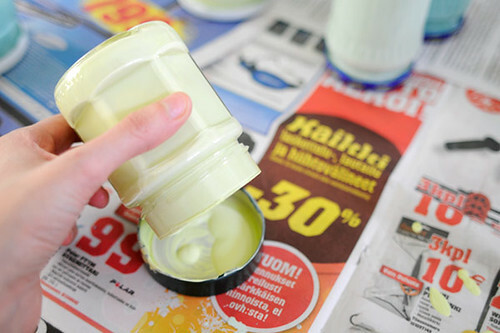 If the paint does dry, you may need to scratch it with your finger nails. Leave the jar to dry. This will take quite long. Normally Uula Into dries in 2 hours, but now it took 2-3 days. Now you have a pretty place to stuff your pens and pencils (for example). I’m happy because the jars have freed up more space on my drawing table AND they look nice. 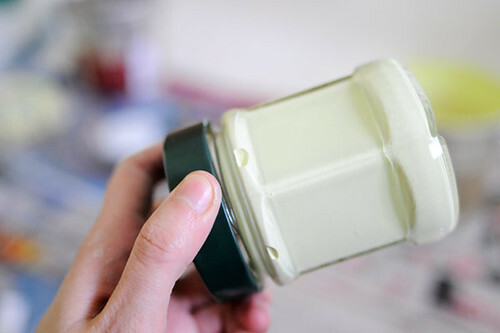 You can also spray paint the lid and use the jar to store little trinkets. I labeled mine with old school Dymo. At least here you can get them from Clas Ohlson. 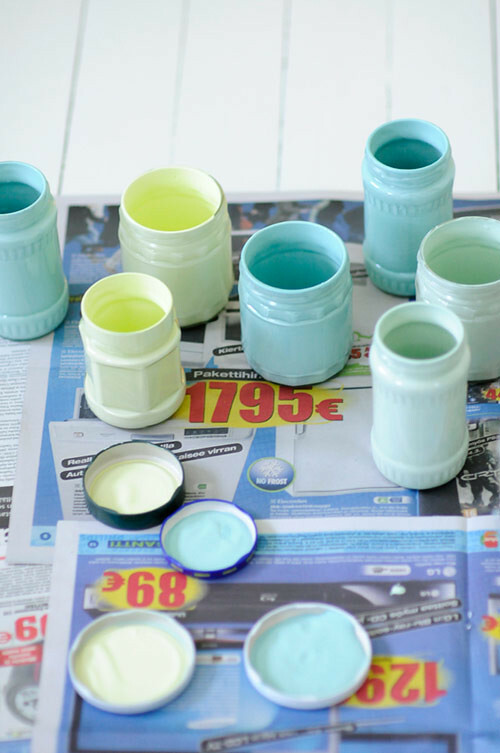 If your paint is not water-soluble (like mine was) you could use the jars also as flower vases. ps- totally want to reach into the screen and add a band of pretty washi tape to one of your jars to see what it looks like, lol! Aivan ihania! Helppo, nopea tapa! Kiitos ja mukavaa viikonloppua! what a wonderful idea! 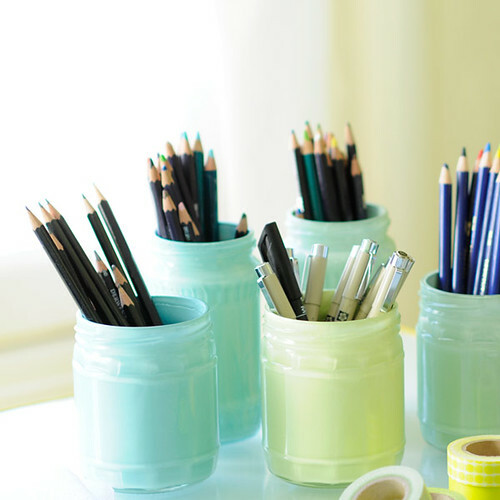 i recently discovered myself that jars can be recolored, reinvented and reused in many may ways but never thought of this. Kiva idea maalata lasipurkit sisältäpäin! Ihania! Kivan yksinkertainen idea ja mahtava lopputulos! Edelliseen työhuonepostaukseesi liittyen, kävin katsastamassa sen Ikean lipaston joka sinullakin oli mielessä, enkä usko että se sopii piirustuslipastoksi. Laatikot eivät ole tarpeeksi syviä jotta sinne mahtuisi A4 leveämpi paperi..
Koo, olikohan se sama lipasto, kun ainakin Ikean sivuilla mainostetaan että sopii A2-papereille? Nuo oikeat piirustuskaapit olisi tietenkin kaikkein parhaita, mutta hirveän hintaisia… Haaveissa on että kohtuuhintainen käytetty osuu vielä kohdalle. Hey you all, thanks for your lovely comments! Awesome idea!! 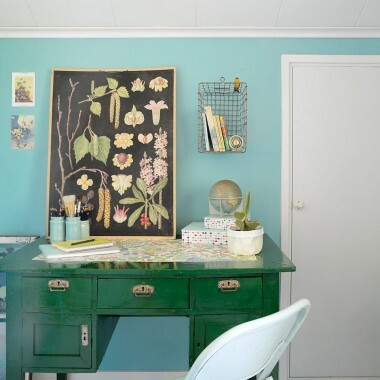 It inspired me to try it as well, see it here – thecolourmilldesigns.blogspot.com. 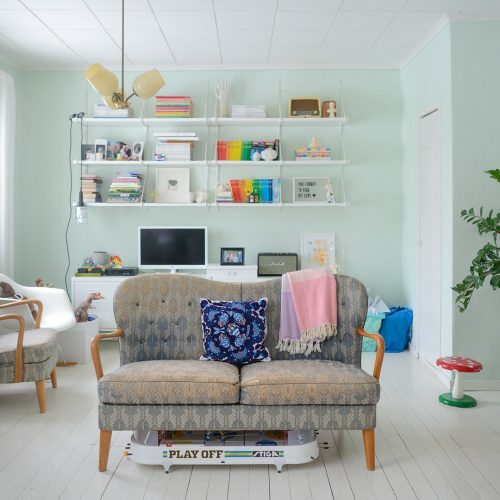 Love your pastel colours.. I used acrylic paints..
Rema, your bottles look great! Thanks for sharing! These are fabulous! Thanks for the tutorial, I just had to share it! Tämä on muuten tosi mahtava idea. En olekaan tullut ajatelleeksi, että purkit voisi maalata sisältä päin. Tyhmä olo, myönnetään. ;) Kiitos, pitää kokeilla! I absolutely love these! And I have lots of old paint lying around. So simple yet super smart. I will be painting jars shortly! They make a great gift too. Fill with pretty pencils and tie with a ribbon around the neck. this is a very good and creative idea!! Clever! AND beautiful! I love repurposing jars and cans, and you have inspired me here. Wow – great tutorial! 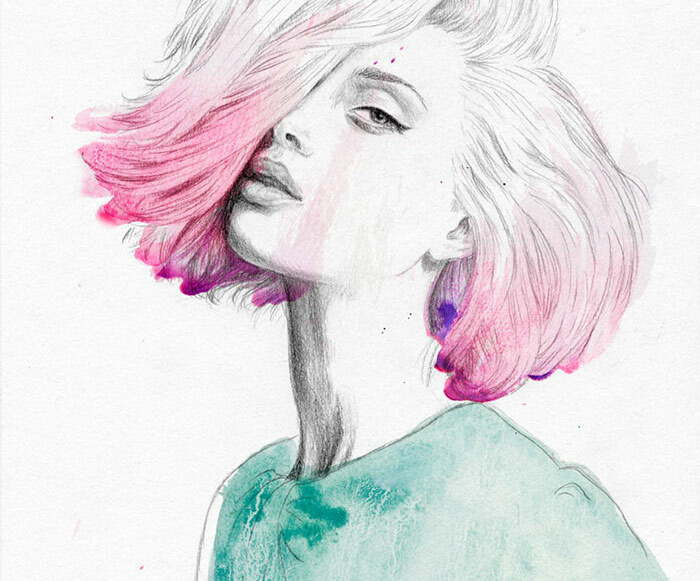 I LOVE your blog, it is so gorgeous. I am a fellow (Canadian) Finn – I am a Hirvasoja/Niemi. But now I’m married so my last name hides my family ethnicity. I am going to start following your blog – I cannot wait to read more! These are beautiful! I need to do this for the jars I store my art supplies in. 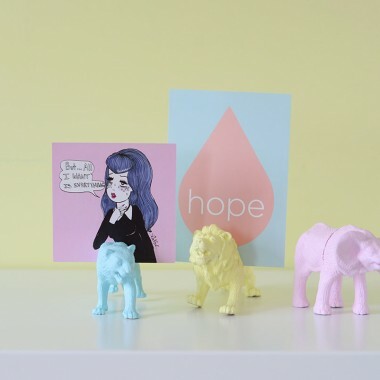 I just found your blog via one of my favourite blogs, and so glad I did! I’ve prompted subscribed and can’t wait to read more. This project looks so fun. Definitely want to give it a try! This is incredible…. 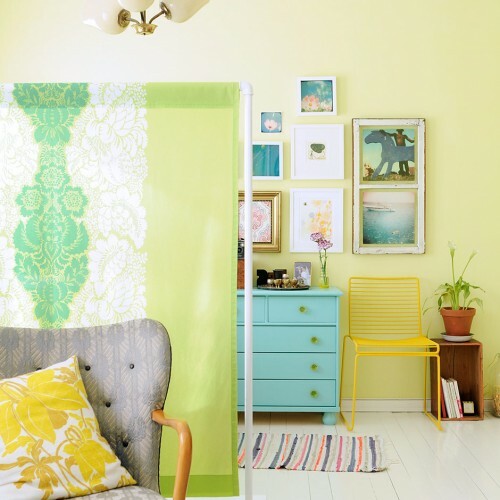 Love the colors that you have used…. Amazing makeover…!! This is so wonderful and inspiring! & I’m really grateful for such honest tips on how it went… so I wont feel like a total failure if mine go wrong! 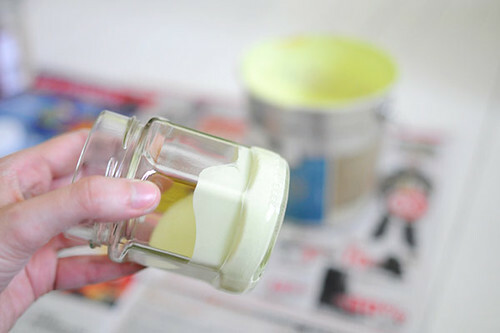 Painting glass jars is such a wonderful idea I wonder how come I never thought of it. Now I can have a beautiful flower vase in any color I like! 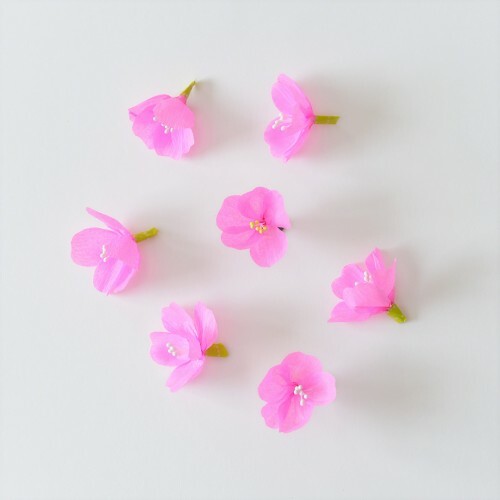 This is my first time to your blog. I’m sure glad I found you because this sounds like a easy craft for me and my 2 1/2 yr. old grandson. We can make them together when I’m with him alone, and save them as gifts for his mom and dad for Christmas. Thanks for sharing, and I’m anxious to see what you have next. Great blog!! aivan loistava idea ja niin kaunis lopputulos! Great tutorial. Love the colors you’ve chosen too. I’ll have to try this with all the jars I’ve collected. Lovely! I found you through Pinterest. I’ll definitely be back for more. Does the paint peel off after awhile? Andrea B, I’ve used the jars since painting them for storing pens, paint brushes, scissors atc. and the paint hasn’t peeled off. I LOVE THIS PROJECT! Thank you! I’m going to try this soon and make flower vase! 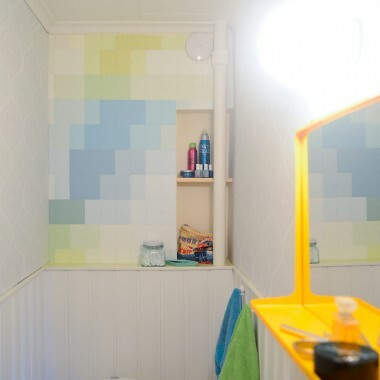 Does it need to be wall paint? Can I use acrylic or anything at a craft store? Happy to find your blog. I am of Finnish descent, so that especially intrigued me! Great tutorial! 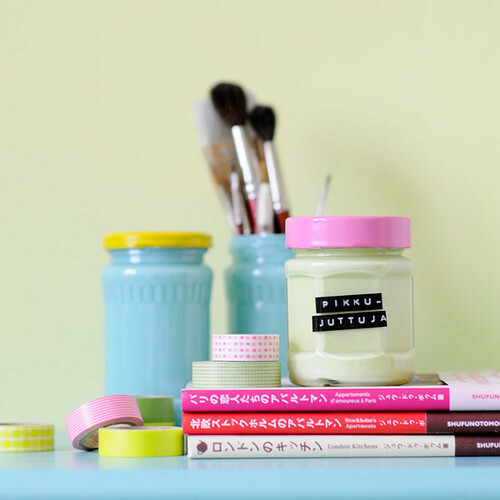 I love the pretty colours your painted your jars in. The ones with the spray-painted lids are too awesome! Thanks for sharing! Wow! Fantastic idea and super simple! I absolutely adore this idea, and I’ll save it in my heart for the day I have a home of my own. Then I’ll keep my nail brushes in them, and make a collection of vases for my pine tree branches. Can’t wait! Kiitos Jutta, can’t wait to try this. 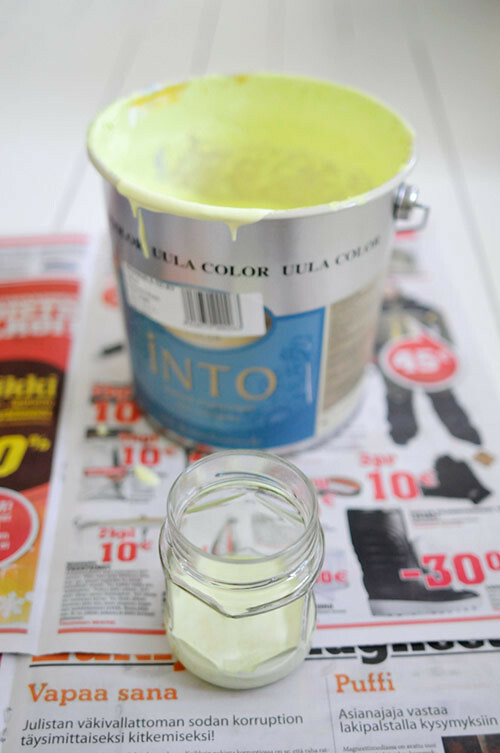 Is there a specific type of paint to use, for flower vases? I don’t want the color to fade. Would like to keep for future use. Any suggestions. Would appreciate any help or ideas. 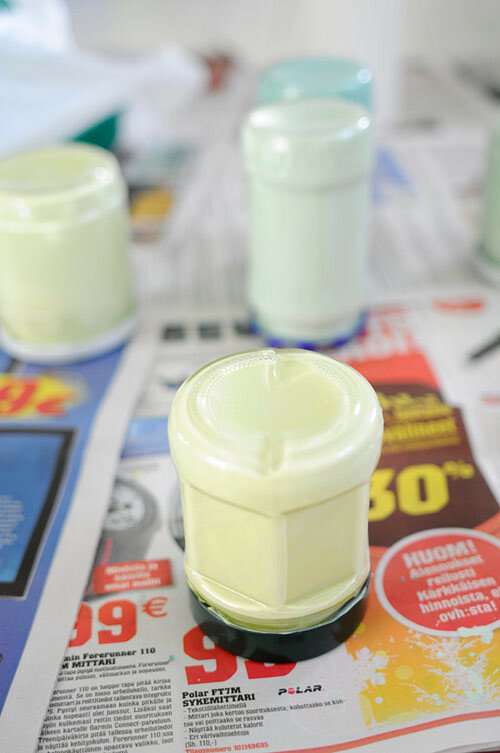 Hi Esmeralda, I haven’t tried it for flower vases, but I would suggest trying with non water-soluble paint and letting the paint dry thoroughly before using it. Can u put a candle in it aswell, or is it not safe? Sachoza, I wouldn’t because you don’t know how the paint is going to react to heat. Maybe you could try an electric tea light. Love these! Just wanted to add that you can find “wire cooling racks” at most Dollar stores… mine were 2 for a buck. I used them to let the jars “drip”. I just put down my newspaper and set the racks on top, turned the jars upside down and let the dripping begin… lol! I was able to clean the racks up for future use but once they get TOO yucky I can just toss them. Or- as I’m prone to doing, find another use for them. Don’t we all need pain covered cooling racks somewhere in our craft rooms?? ?